"Wait... Why am I rolling? Am I moving or are the trees moving? What'd you say about my brakes? Youtookoutmywhaaat? Holy Cow I Can't Staaahp!!" Hi Railride. Some of the 0 scalers in Germany have already motorized these and have even cut them up and lengthed them to make them more protptipcal. I even believe some has made up a drive unit for these too. Well, I imagine the German modelers managed to craft 2-rail finescale power trucks somewhere. Three-rail trucks would be magical. In my hypothetical empire, light-rail/trolley routes would have a physical connection to the rest of the layout somewhere, so I'd have to have some means of 3R traction (I could cobble together an assembly for non-powered bogies), to warrant pursuing the acquisition of some of these cars for the purposes of effecting a powered conversion. Especially the newest DMU's as the prototypes do run in mixed service, as far as I know. I have long wanted a three rail below floor power truck, with adjustable wheelbase, and interchangeable sideframes, needed for an assortment of gas electrics, railbuses, and even geared locomotives. That ain't rocket science....somebody tool this up! I believe a company called Northwest Short Line (NWSL) makes, or used to make a motorized truck called the "magic carpet" drive for these applications. And there was another one too, called (I think) the Black Beetle. These are meant for trolley/transit not pulling long consists. Google around and see what you come up with. I approached NWSL years ago, and got sneered at for wanting it for three rail applications. The Black Beetle is only available with finescale wheelsets. They do have an O-Gauge version for PCC's, so I guess that's a start. The problem I see is that nobody seems to believe 3-railers would ever undertake such conversion projects. WHo knows, if someone could engineer and 3D print a suitable truck block with allowances for geared axles and a motor mount, they might be motivated to figure out how to connect it all if they get a sample. Ot maybe someone could talk to the aforementioned Germans to see if what they came up with could be rigged with 3R wheelsets. There is a need, I agree., Reasonably priced qualty motor gearbox kits for small low rpm applications don't seem to exist anymore in any hobby lately. (I figured RC would havs,reductions but it seems not... Or the were too wide, I forget I eyeballed so many gearboxes lol. The self contained nature of tbe present carpet units and being a 2r design might make 3 rail use harder,without external wipers to manipulate the wires off of. I imagine the overall width might even be an issue; leaving wide tread wheels over gauged. ?? 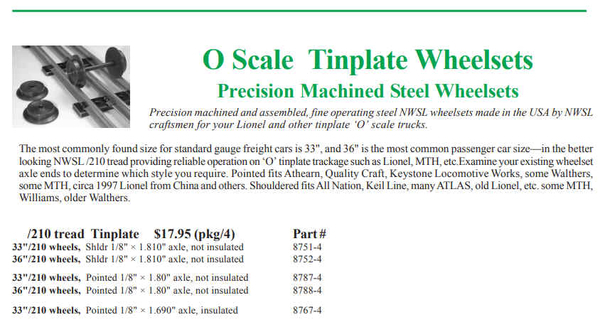 The gear size on an axle is limited more as wheel size drops too; reduction suffers. You are correct that this is not "rocket science"; however ,it probably has not been done since those that could do it do not believe that there is adequate market numbers to support such an endeavor. Couple this with the incessant requirement that the price be "reasonable" (read "cheap") and you can pretty much assure that this will not happen any time soon. There are the Magic Carpet drives and then there are the drives from Q-car - 2-rail - not cheap and therefore grades as unreasonable. Their prices are what they are due to market numbers and in the case of the latter literally being built to order. Clearly the demand even for those is such to only support a single source built to order operation. Suggest that you find a way to purchase (read "liberate") the stock and dies of Current Lines and go into business yourself. Tooling up sideframe dies alone will otherwise make this completely unapproachable - consider the limited number of currently available truck sideframes in O scale vs. HO (for example). One has to have the numbers. Conversion of a Magic Carpet drive seems like a possibility--if the axles used in them are the same size as the 3R wheelsets NWSL can provide. Sideframes for these two railcars shouldn't be too much of a problem--The City Liner has shrouded trucks so the lack of sideframes isn't a problem, and the LINT DMU already has reasonably detailed sideframes as part of its dummy wheelsets, they could be cut off and mounted on a simple bracket attached to the converted motor truck. 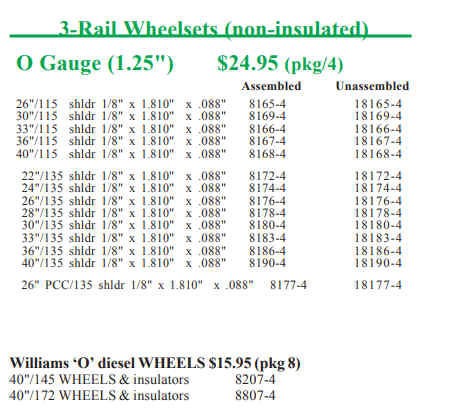 I briefly thought about the drive units 3rd Rail used in their RDC's and Electroliners, but I figured they were one-off assemblies or customized to the extent that building any outside of production for a regular 3rd Rail project would be cost-prohibitive (i.e. in excess of $100 each). Probably the best time to ask about that possibility would be the next time 3rd Rail produces a powered unit with underfloor motor trucks, since at some point their supplier will be set up to build them and the possibility would then exist that they could produce a few extras for resale for hobbyist projects like this. You'd likely have to ask about this once production of the actual product they're going in is greenlighted, and be willing to reserve them in much the same fashion as 3rd Rail's regular product.